At its simplest, a drive enclosure is a metal or plastic housing designed to cover and protect a disk drive from damage. Drive enclosures can house single or multiple drives and also contain a method for connecting the drive to a host computer. Drive enclosures are typically thought of as stand-alone devices that provide power to the drive(s) and one or more types of interfaces (USB 3.0, for example). As such, a drive enclosure is synonymous with an external drive used for storage expansion for a laptop or desktop computer. Drive enclosures can also be removable devices designed to insert into (and be removed from) frames and carriers that are built into host devices, whether that host device be a computer workstation, laptop, or some other device used to ingest or read data such as a digital projection system in a movie theater. A common example of a drive enclosure is a stand-alone external drive used as additional data storage for a laptop or desktop computer. What you see when looking at an external drive is a combination of several items: the external ‘enclosure’ (typically made of plastic, sheet metal, or aluminum), the unseen internal disk drive or SSD, and one or more ports, which connect the drive via cable to a computer. The enclosure also houses electronics used for communicating between the disk media and the host computer. Quite often, external hard drive/enclosure combinations are not designed for easy swapping or replacement of disk drives. 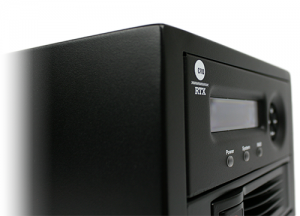 Depending on your workflow, storage requirements, backup practices, and so forth, you may want an enclosure that allows you to use non-proprietary drives or ones made by your favorite manufacturer. This way, you can add storage space by getting new disks and adding them to your collection, without having a big stack of separate drives, each in their own enclosure, piling up on your desk with a big mess of cables.